There’s a lot of plastic waste in the world. Even the most conscience of us will from time to time use a plastic bottle to have a drink of water or soda, especially while we’re out. You find these bottles in the garbage and worse, on the ground. This interesting technique from Joining Bottles turns empty bottles into an adhesive. 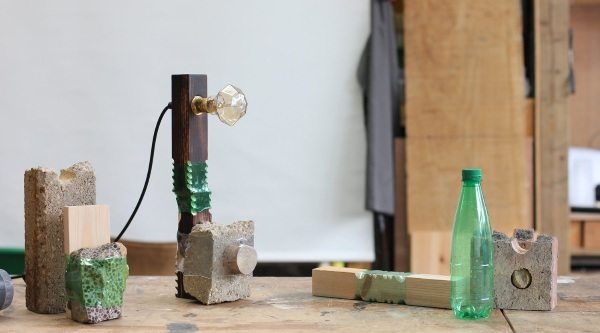 Just using a heat gun and discarded plastic bottles, you can mold the plastic to the form you are attempting to bind together. The plastic can be cut to fit and the end result it a sturdy hold. The original designer used this process to create stools but you can do whatever you want. This appears to work well with wood and stone or concrete but there’s no reason why you can’t experiment with materials to create something new and fresh with it. Practices safely in a well-ventilated area. Have fun, see what else you can come up with or check out the website for more inspiration.